Bioceramics are an important class of biomaterials. Due to their desirable attributes such as biocompatibility and osseointegration, as well as their similarity in structure to bone and teeth, ceramic biomaterials have been successfully used in hard tissue applications. 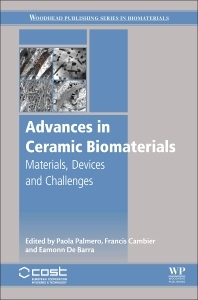 In this book, a team of materials research scientists, engineers, and clinicians bridge the gap between materials science and clinical commercialization providing integrated coverage of bioceramics, their applications and challenges. The book is divided into three parts. The first part is a review of classes of medical-grade ceramic materials, their synthesis and processing as well as methods of property assessment. The second part contains a review of ceramic medical products and devices developed, their evolution, their clinical applications and some of the lessons learned from decades of clinical use. The third part outlines the challenges to improve performance and the directions that novel approaches and advanced technologies are taking, to meet these challenges. With a focus on the dialogue between surgeons, engineers, material scientists, and biologists, this book is a valuable resource for researchers and engineers working toward long-lasting, reliable, customized biomedical ceramic and composites devices. Paola Palmero is Associate Professor of Material Science and Technology at Politecnico of Torino. She has around 15 years’ experience in the design, development, and characterization of ceramic materials, including monolithic, composite, and nanocomposites ceramics for biomedical, functional, mechanical, and thermomechanical applications. She is Vice-Chair of the Cost Action“New Generation Biomimetic and Customized Implants for Bone Engineering” (NEWGEN)—the current largest European network on biomaterials, and she has an active participation to FP6, FP7, and H2020 European projects. Her scientific production counts on over 90 papers, 6 patents, and numerous invited talks in international conferences. Eamonn De Barra is a materials scientist with over twenty years’ experience in the development and commercialisation of a range of biomaterials and medical devices for dental and orthopaedic applications. With experience of biomaterials from development to translation, Dr. de Barra has previously developed and commercialised a complete product range of dental materials; developed, manufactured and marketed 6 novel precious metal alloys for prosthodontic applications, as well as developing a commercial bioactive bone cement for Ossicular Chain Reconstruction and an injectable bone substitute for Craniotomy Defect Closure. His current research interest is focused on purely commercial orthopaedic materials development, leading a range of research projects based on developing new orthopaedic implantable materials and tailoring their properties in order to optimise their in-vitro and in-vivo performance, as well as the handling and performance requirements dictated by defined user and clinical needs. Francis Cambier is director General of the Belgium Ceramic Research Centre (BCRC), closely linked with the Belgian Ceramic Industry Association and the INISMa, a joint institute with the University of Mons. With over 30 years’ experience in the field, Dr Cambier is involved in the management boards of several companies and associations and he has received several distinctions in Belgium: Officer of the Leopold II Order, honorary dean of work. He is also very active in many ceramic societies and a member of various scientific advisory boards and journals.